Hope you all had wonderful holidays and are back rested and ready to tackle the upcoming year! We have been spending time with family and taking a couple of days off from the internet and the computer, just to clear our heads a bit. We have also been cooking and eating, enjoying desserts and champagne, and all that. And we think it’s just about time we set cookies aside and dive into some healthy foods instead! Are you ready for Healthy January? We sure are and we’ll be posting more healthy easy meals in the upcoming weeks! 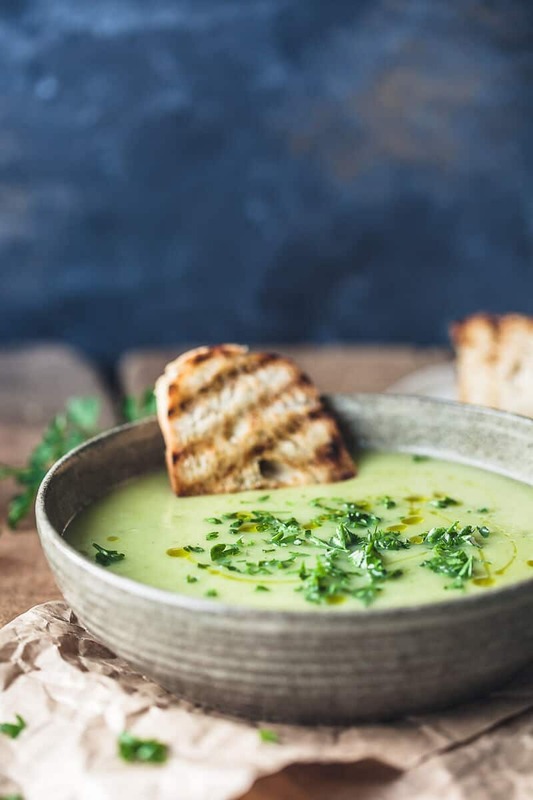 So here is a quick and easy recipe for a Creamy Vegan Potato Leek Soup, that is healthy, filling and can be done in just about 30 minutes! 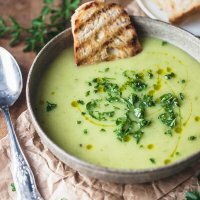 For this Potato Leek Soup recipe just chop vegetables that you probably have at hand already, place them in a pot and cook until the potatoes turn tender. Then a quick blend to turn the soup creamy and it’s already ready to serve! 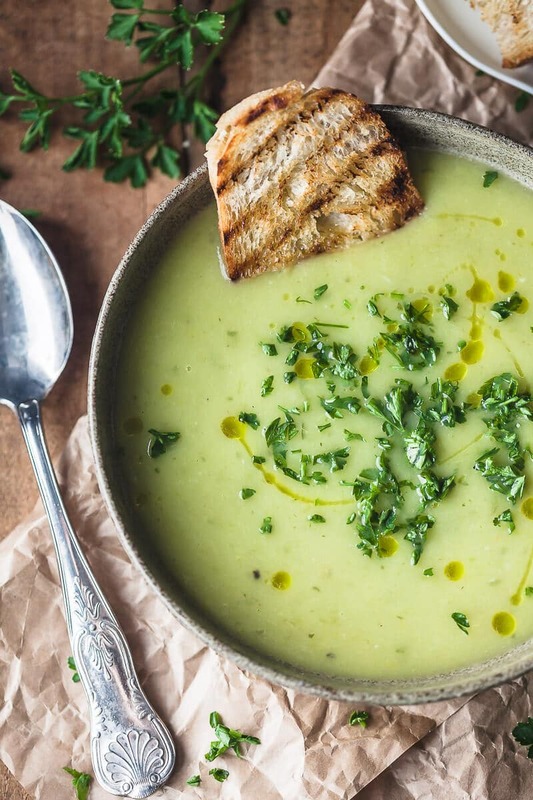 This soup couldn’t be easier to make and it’s just perfect to warm you up! 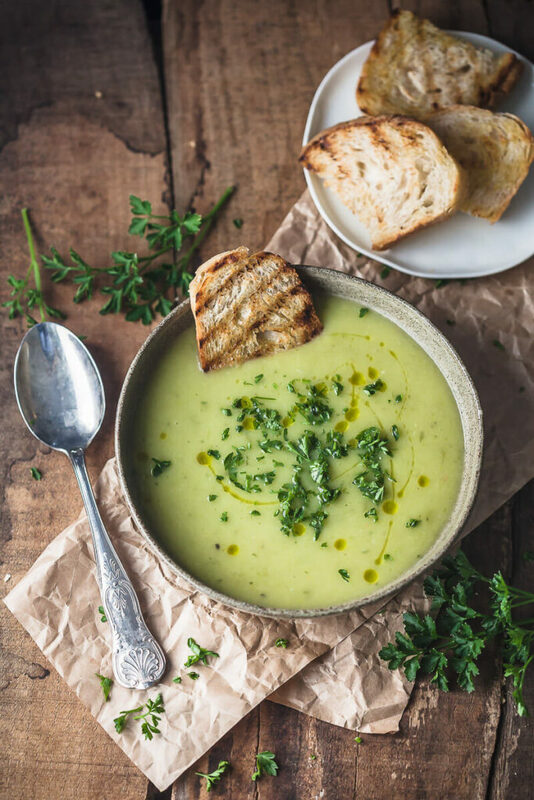 Serve hot with a drizzle of olive oil and a sprinkle of chopped parsley on top for a lovely healthy dinner! Cut leek in half lenght-wise and wash thoroughly between leaves. Drain and cut into slices. Peel potatoes and dice. Peel and slice garlic cloves. Heat a pot on medium and add a tablespoon of olive oil. When heated, add sliced leek and stir-fry for a minute, until the leeks turn a bright green color. Then, add diced potatoes and garlic slices. Cook for another minute or two, stirring regularly to make sure the vegetables do not stick to the pot, then add vegetable stock. Season with salt and pepper to taste, add bay leaf and chopped parsley and cook until the potatoes turn soft. If needed, add more water while cooking. When the vegetables are cooked, remove the bay leaf and puree with a stick blender until creamy. If the soup is too thick, add more water and blend quickly to combine. Taste the soup and season with more salt and pepper to taste. Serve hot with a drizzle of olive oil and a sprinkle of chopped parsley. Absoultely goregous!! cannot wait to try this! I made this tonight, and it is easily one of the best soups I’ve eaten… and I’m actually not that great at cooking. I just made this and it is absolutely delicious. One of our favorite soup. Easy to make and deliciuos!. Thanks for the recipe.